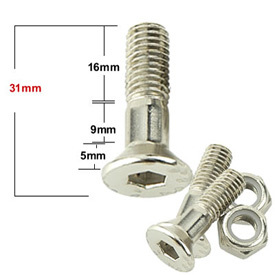 Set includes six bolts, six nylon lock nuts and washers (when needed). Click on "Larger View" and refer to picture diagram for proper fitment. Fit the primary Drive sprocket great. No install problems, straight forward. Works good, keep checking tightness just to be sure these came with torx patern just like OEM. If you dont want that order motion pro set. I first used Primary Drive sprocket bolts on my KTM 500 EXC. I was so impressed they are now on all three of my KTMs. The quality is as good or better than the BIG name companies and less expensive. Good quality and price, definitely worth it to add these anytime you replace your sprocket. These sprocket bolt kits are good quality. I have not had any trouble with any primary drive product. The sprocket bolt kit has the spiral lock nuts. Great products at the best price point. Nice quality and comes with loctite already applied. Price is great! These are good replacement bolts. Already have thread lock installed and they are the same as OEM. The nuts are lock nuts with a flange. I re-used the OEM washers as none came with these. Not sure if the flange nuts replace the washer and there were no instructions covering this. Fit great. I’ll buy them again next time. Not a good choice for KTM. Don't kid yourself these are bigger than OEM. You're riding a KTM don't get these they stick out of your sprocket and grab stuff on the trail. Good tire for all around riding. Motocross and XC racing. Great replacement. Look great and have held up just fine. Would highly recommend. these are pretty high quality fasteners in my opinion. one good feature is the larger hex size, which won't strip or round out as easily as some sprocket bolts with smaller hexes. the locking nuts do get tight as they should. No issues bolted right in.. Would buy another in a heartbeat. Works flawlessly and the price is right. Love 'em and will order again next time I need a set. Tough and ready to get the job done. Scientists are running tests to see if I gained any HP when I installed them. the guy i bought my bike from stipped all of the bolts so i had to replace them with these. Excellent price and fitment on a 2004 crf450r. You cannot beat the price of these. Fit like oem and the quality is very good. I would absolutely buy these again. Was putting on the third rear sprocket and felt it was time for new bolts. Perfect price and fit as well as already have thread locker on the bolts. Right on! Great fitment, looks, durability, and price. Way better than OEM. Replace the rear bolts/nuts at every sprocket change, these work perfectly and mimic stock without any issues. Highly recommended. Couldn't be simpler, don't waste money on more expensive ones. These are pre loctited and work perfect. Nice big hex head on them, almost impossible to strip. Work as good as anything else and the price is great. Very durable and inexpensive, I highly recommend this product. Just like OEM. Great quality, perfect fit, durable and very good price! Can't beat it. Nice deep 8mm heads, no washers, and loctite already on the threads for a dirt cheap price make these a great value when swapping sprockets! Change with every chain and sprockets. The price of this kits makes it a cheap no brainer insurance policy when changing chain and sprockets on your bike. The pre-lubed Loctite is a nice touch, just torque them down and go. Im currently on my 4th set of these and will continue to use them! Fixed the problem i had with my sprocket bolts coming loose every ride...no more loose sprocket! Used these to replace the OEM bolts on my 2003 GasGas EC200. The torx socket head takes a larger #45 socket which makes tightening the bolts easier. The fit was perfect and thread locker was already on the bolt. Nice part! These bolts are tough! I purchased another brand that broke while being torqued to spec. These things are far superior and will last a long time. When they do finally wear out I will buy another set. Good quality sprocket bolts! Nice bolt package. Seem to be well made and the fit is perfect, as is the price. I will purchase again..
Used on my 2010 KX450f changed from 48 to 51 rear sprocket (primary drive brand as well). Seated perfectly, buy the sprocket, buy the bolt kit, done and done. These bolts fit nicely and are priced reasonably well. I'd buy them again. Great product. Locktite included!!! Stainless steel and complete kit for replacement. Whats there really to say, comes with nylon locking nuts. Saves a few bucks from the big name companies. Everything fit perfectly. Way easier & cheaper than oem! Man I'm happy that Rocky Mountain carries this nut/boltkit! I rebuilt my bike this past winter and it was way easier & cheaper to order this kit than order oem. The kit works flawlessly and I highly recommend it to anyone who actually maintains their ride! Duh, of course they bolt right up. They're bolts. But seriously, I think these are superior to stock. At least on my KTM. Fit was better and you can really torque the torque heads. But you will want some torque sockets for these. Luckily I had the tools but don't let that stop you. These are quality. Do these bolts require a torx wrench, or an Allen wrench? Allen head. Way deeper set than the OEM which makes it easy to use a torque wrench and not worry about rounding it out. These bolts are torx. I have used them several times without any issues. Allen, I use a Allen socket and a box end wrench. Those require a Allen wrench.